If you like this game, you might also enjoy the Inca Ball game where you try to match up like-colored balls. The idea of Bubble Hit is form three-of-a-kind by color in the most efficient way possible. This is not a complicated game, but there is a bit of strategy involved. It's also very addicting! HOW TO PLAY. No need to rush, as you are not on a timer. 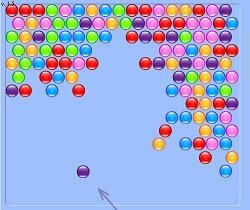 Using the mouse, aim your arrow toward the bubbles at the top of the screen. What you want to do is find groups of bubbles at the top that have the same color as the bubble you are about to shoot. For example, suppose the bubble at the base of your arrow is purple. Look at the top of the screen for groups of purple bubbles that you can hit with your bubble. Aim and click, it's pretty simple. The point of this bubble breaker game is to make the bubbles disappear faster than new ones appear. New rows of bubbles appear whenever the counter in the lower left goes below zero. Each time you form three-or-mores, those bubbles disappear and the countdown counter stays the same. Whenever you shoot a bubble without making any bubbles disappear, the counter decreases by one. TRICKS AND STRATEGY. 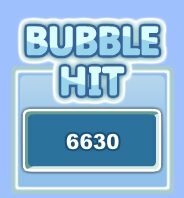 There are a couple tricks for doing well at Bubble Hit. First, you can bounce bubbles off the walls. Sometimes you'll see a group of bubbles that you want to hit that are blocked by other bubbles of the wrong color. If they bubble you want are near a wall and there is a gap, you can try a bank shot to squeeze your bubble through and complete the set. One of the best ways to clear bubbles is to complete color groups that are located above other bubbles. Bubbles lower than your color group that are touching that group also disappear with the color group you form. BUBBLE HIT STATS. The game remembers your wins and losses during the current session. Click the Statistics button along the left to see your win/loss record or to reset the record. OPTIONS. Bubble hit has a couple of optional settings. If you'd like to change the background color or the volume of the sound effects, click the Options button. Bubble breaker games like Bubble Hit, Bubble Trouble, and related games are not particularly "intellectual". But they do train concentration. Concentration is critical in obtaining the "Original Awareness" of information necessary whenever you are learning something new and need to remember it. Strengthening your ability to concentrate is a very good thing to do!